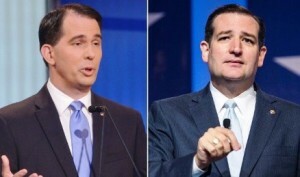 On Tuesday morning, Scott Walker the Wisconsin Governor announced on a radio talk show that he was proud to be endorsing Texas Senator Ted Cruz. Walker said that following a great deal of time and thought, as well as much prayer about his decision, he decided that following many years of failure with Obama-Clinton it was time a new, strong leader was elected. He said that Ted Cruz was the person. He said he was endorsing Cruz because he is a constitutional conservative and he is not afraid to take on the special interest groups. He added that if you look at all the facts and look at all the numbers, Cruz sits in the best place by a large margin to win both the GOP Party’s nomination and the White House in the November general election. Walker laid low since ending his own campaign for the presidency only 71 days after starting it. At first, he was thought to be an early front runner for his party’s nomination, but he failed to find any traction in a primary field following two poor debate performances. When he ended his campaign, he called on others in the GOP to do the same in order to find a positive alternative that is conservative to the current (Donald Trump) front runner. Trump continues to be the favorite to win his party’s nomination following months of primary contests that have cut the field, but left him as No. 1. The importance of being victorious in Wisconsin has increased significantly, as Trump attempts to reach the magic number of 1,237 delegates to win the nomination without any contested convention. A Badger State victory by Cruz would bring him that much closer in overall delegates and make a contested convention much more likely to take place. Trump preempted the announcement by Walker on Monday night via a tweet that jabbed the governor and reminding all of the other candidates who also left the race.